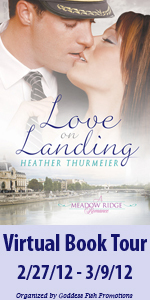 Love on Landing — Blog Tour! Starting next week, I’m going on a virtual book tour with Goddess Fish Promotions! I’ll be stopping at 10 different blogs along the way. Stop by each blog for an exciting interview or guest post AND a chance to win! Every comment on each blog enters you into a drawing for a $25 Amazon.com gift card!